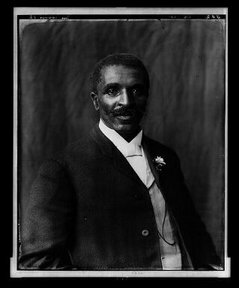 Dr. George Washington Carver (c. 1864-5 – January 5, 1943) was an African-American botanist who worked in agricultural extension in the southern United States. He taught former slaves farming techniques for self-sufficiency and is known for suggesting hundreds of uses for the peanut and other plants to increase the profitability of farming. Carver was born into slavery in Newton county, Marion Township, Missouri, in an area now known as Diamond, Missouri. The exact date of birth is unknown due to the haphazard record keeping by slave owners but "it seems likely that he was born in the spring of 1865" . His owner, Moses Carver, was a German immigrant who also owned his mother, Mary, and brother. The identity of Carver's father is unknown but he believed his father was from a neighboring farm and died — shortly after Carver's birth — in a log-hauling accident. When George was an infant, he and his mother were kidnapped by Confederate night raiders who hoped to sell them elsewhere, a common practice. Moses Carver hired John Bentley to find them. Carver's mother had already been sold but Carver, near death, was returned to Moses by Bentley. Moses Carver rewarded him with his best "filly." This episode caused a bout of respiratory disease that left him with a permanently weakened constitution. Because of this, he was unable to work as a hand and spent his time wandering the fields, drawn to the varieties of wild plants. He became so knowledgeable that he was known by Moses Carvers' neighbors as "the plant doctor." After slavery was abolished, Moses and his wife raised George and his brother as their own. They encouraged Carver to continue his intellectual pursuits. When George was 12, he decided to strike out on his own, much to the Carvers' distress. He had set out to get an education, and his first destination was a school in a different town. To his dismay, when he reached the town, the school had been closed for the night. As he had nowhere to stay, he slept in a nearby barn. By his own account, the next morning he met a kindly woman from whom he wished to rent a room. When he identified himself "Carver's George," as he had done his whole life, she replied that from now on, his name was "George Carver." They then struck a deal: he would be paid money for cooking for the family and he could go to school. He lived under the steps of the family porch until his money was sufficient to buy a shack. He was eventually forced to leave town because of a lynching of a black person. He promptly left, but still carried scars from this incident for the rest of his life. In 1923, Carver received the Spingarn Medal by the NAACP. The NAACP awards this medal annually for outstanding achievement. In 1928, Simpson College bestowed Carver with an honorary doctorate. In 1940, Carver established the George Washington Carver Foundation at Tuskegee University. In 1941, the George Washington Carver Museum was dedicated at the Tuskegee Institute. In 1942, Carver received the Roosevelt Medal for Outstanding Contribution to Southern Agriculture. On July 14, 1943 , President Franklin Delano Roosevelt dedicated $30,000 for the national monument west-south-west of Diamond, Missouri of the area of his childhood as a park. This dedication marks the first national monument dedicated to an African-American. At this 210 acre national monument, there is a bust of Carver, a 3/4 mile nature trail, a museum, the Moses Carver house, and the Carver cemetery. Carver appeared on US commemorative stamps in 1947 and 1998 and was depicted on a commemorative half-dollar in 1953. The USS George Washington Carver (SSBN-656) is also named in his honor. In 1977, Carver was elected to the Hall of Fame for Great Americans. In 1990, Carver was inducted into the National Inventors Hall of Fame. Iowa State University awarded Carver the Doctor of Humane Letters in 1994. On February 15, 2005, an episode of Modern Marvels included scenes from within Iowa State University's Food Sciences Building and about Carver's work.